Broadcast Sports Inc. has long been known as one of the chief remote-production vendors for RF cameras, mics, and transmission. However, over the past year, BSI has begun productizing some of its technology for sale,led by its new Real Freedom wireless-camera-system product line, which is on display at NAB 2014 this week. Also being demonstrated at the show are the MIC7000 7Ghz wireless microphone and the new 360° pan/tilt on-board camera.SVG sat down with BSI General Manager Peter Larsson to discuss the company's first products available for sale, how BSI is working with the FCC on spectrum issues, and what to expect in Augusta at the Masters this weekend. BSI General Manager Peter Larsson with the new Real Freedom wireless camera system. Over the past year, BSI has begun selling products in addition to your longstanding role as an equipment and facilities renter. How has that transition gone so far? 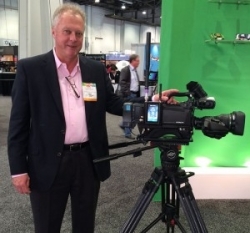 Last year at NAB, we were demonstrating our product, but now we are ready to take orders. Back when the BAS [Broadcast Auxiliary Service] transition occurred and Nextel paid everyone to transition all their equipment, we got about 120 systems from them. The product lifespan is about eight years, so they are coming to the end of their life. So we are faced with a dilemma: do we go out again and spend $5 million on another manufacturer's gear, or do we spend $3 million-$4 million ourselves and have a product we can sell to other people? We want to have a product that is good for everyone else to use, as well as for ourselves. So we fulfill both our needs by developing out own systems. And how has the response been so far from customers? The first two days of the show have been extremely busy. The reception has been great. The thing that I'm surprised by the amount of attention we have garnered is the basic 360-camera that we stick in the NASCAR cars. We just brought the 360-camera system along as a demonstration, but it has garnered so much interest that that we need to productize it. Previously, we have always built products to about 80%, which is fine if your own guys are using it because they know the workarounds. But, if it is something that goes to a customer then, it has to be 100% perfect. We have always built our own gear, but this is just the next step in that process. What is BSI doing to help the live-production industry deal with the pending spectrum reallocation? We have been working with the FCC as to what we are going to do when all the spectrum disappears. The FCC gave us an experimental license to test the classic Blue Steel concept in 7 GHz, which we are showing here at NAB. For the broadcasters, there are 10 channels available in 7 GHz, exactly the same as the 2 GHz BAS band. Back when it was dedicated to broadcasters, the frequency stability of a 7-Ghz transmitter was not that great so they gave them 25-meg wide channels to deal with a much more significant frequency error in your transmitter. Nowadays, the technology is so much better and with the compression in HD, you only need 8 meg per channel even though there are 25 megs given to that channel. People have been using two and three HD transmitters per 25 meg. Don't get me wrong, there are limitations in 7 GHz. It is not a direct replacement for UHF. But, if you look at what most of the wireless mics are doing, it's a talking end that is 10 ft. in front of the cameras. So, if we can transition those people up in 7 GHz, that will free up the UHF for the more demanding applications of wireless mics. The FCC is very aware of the question of where the wireless mics will go once the reverse auction occurs, and they have been very proactive with us in trying to come up with a solution. This is just one of many solutions that they are looking at. Can you give us a quick preview of what BSI will be doing at the Masters for CBS Sports this weekend? I'm really happy with what we are doing for CBS Golf. We came in with a totally new concept that allows us to get rid of the cranes and the people that hold the antennas. The technology worked well, but you would always be getting cranes in shots. It's much cleaner when the guys are walking down the fairway so that there is only the cameraman instead of a gaggle of people. The freedom lets those guys get into positions that they never would have been able to and give the camera operators a lot more creative freedom. We went down to [Augusta] to see if we could set up a couple of little microsites in case of a player poking his tee shot deep into the woods. That test went so well that we started totally rethinking how we covered [the event]. We came up with a concept based on the technology we use to receive the car cameras [for NASCAR], where we place the antennas around the track fibered back to a switching system. We basically transferred that switching system to golf .and it's been working remarkably well.